Marriage is on a decline in North America. Fewer and fewer couples are choosing to walk down the aisle. Many women believe that is because most men either don’t want to get married or are afraid of marriage. This in fact is not true. Conducting our own study, we stopped single man on the street and ask them if they would like to be married at some point in their life. Just over 80% of those men said yes. Men want to get married and they do see themselves getting married at some point in their lives. I’m sure you are asking yourself, “Well if men do want to get married then why won’t my boyfriend propose?” The problem is not that men don’t want to get married, it is that some women have not learned how to properly motivate the man they are with into wanting to get married. That is why we created this website, to help all women who are interested in getting their boyfriend to pop the question. There is nothing worst then seeing a couple in love just floundering in their relationship because he has cold feet and she is no longer happy watching her friends getting married. Don’t let this happen to you. All the guys (single & married) will be unleashing all the motivators, deep thoughts and secret emotions men hide in regards to marriage. 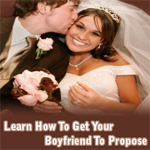 Just subscribe for free in the box to the right and start learning right now about exactly what you need to do in order to get your boyfriend desperate to marry you. Don’t make the same mistake millions of women make each year and chase your man away from pressuring him to marry you. Learn from all the men here at WomenMenMarry.com, exactly what you need to do to get him to chase you for marriage!